This is what the curtains in the dining room used to look like. I know I am stating the obvious, but this picture was taken at Christmas. Notice the curtains…..which used to be dropcloths. I had dropcloth curtains for two years. I loved them. I mean….how can you not truly heart a ten foot curtain panel for $9.99 from Lowe’s. I didn’t even sew them….just clipped to some curtain rods from a discount store and draped them over stationary tie-backs. Did I mention they were $9.99? 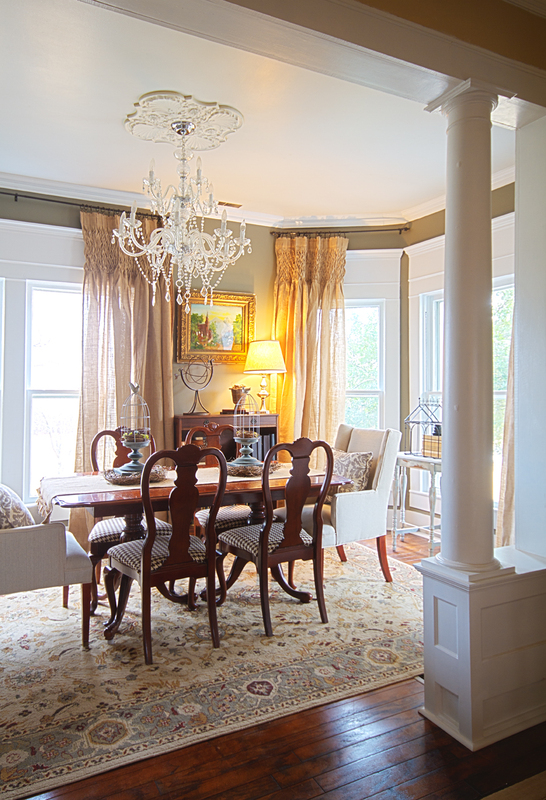 If you want to add dropcloth curtains to your home and you need encouragement….please e-mail me. If you want to know more about burlap curtains….see below. 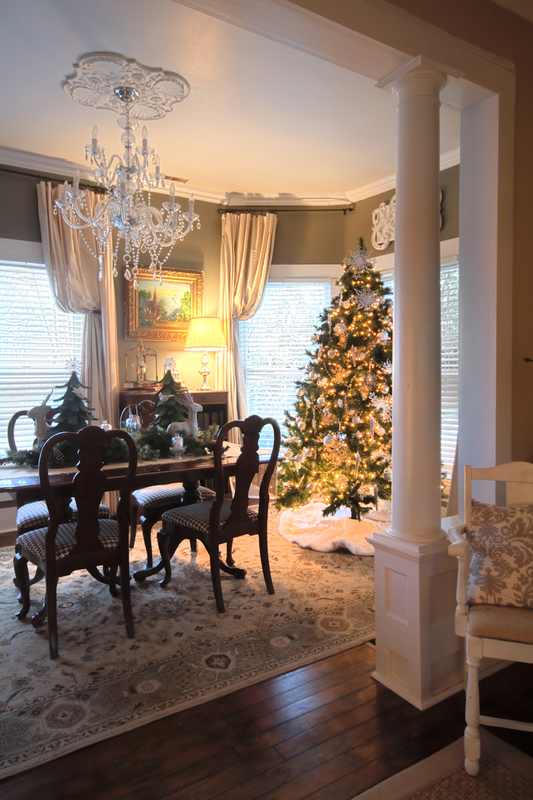 After two years of drop cloth curtains…. …..on Christmas morning, I opened these….from my mother. Is she a rock star, or what? Then, I hung up the burlap curtains and retired my dropcloth drapes to my dining room table for my next painting project. 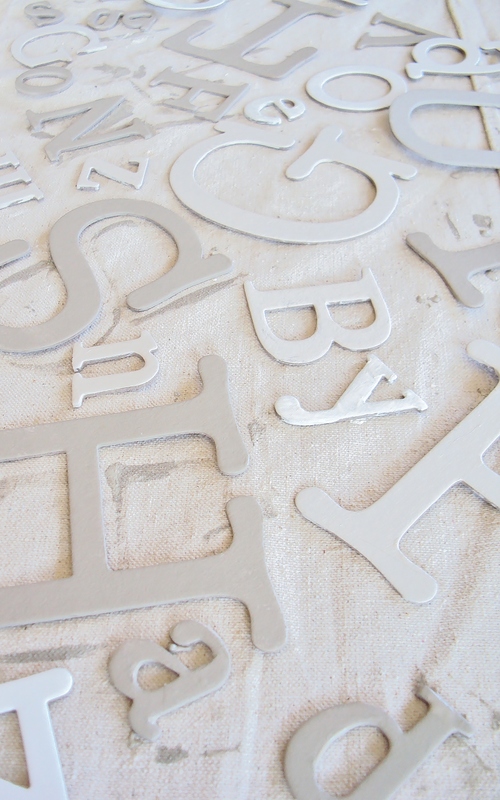 Here are my old curtains on my dining room table when I was painting letters for my typography project. I truly think they were happier with paint on them. Now my dining room looks like this. Simply stated, I didn’t make the curtains. I wish so much I would have thought of it. I might have tried if I had. If you want to try….I found this great idea on Pinterest. If you try it and works on burlap, let me know. I do have some other curtains in this house that would thank you. PS I am going to Haven. If you are going….e-mail me and let’s party! Your mom does rock! !..Rocks to the smock...I so love them..I was hoping that you were NOT going to say that you made them..if you did, I would have to give up the idea of ever owning them...or get charged a bazillion dollars to have them made.. They were made for that room..and Yay! !..cannot wait to meet you at Haven!!.. Thanks for the info on the drapes. Love them and what a sweet mom you have. I don't plan on attending Haven, but live near Atlanta. May have to meet some of y'all if there is time. Thanks so much for visiting it's robin with an i. I am your newest follower. Those drapes are amazing. Your mother is the official gift queen. They are fabulous. I'm going, I'm going!!!! :) I'm traveling with Shirley at HousepitalityDesigns.com So excited! Can't wait to meet you in person. i am wishing i was no broke right now because that is a smoking deal and those curtains would look awesome in my bedroom!!! and i meant not broke... oops. What a beautiful dining room! Those burlap curtains are fantastic! You're the rock star for sharing the source and the hugely marked-down curtain panels. I almost had to jump on them, but since I don't know exactly where/how I would use them, I'm going to pass. (And might regret it, but have too many impulse purchase regrets in my past...) Alas, I will more likely end up with the 9.99 drop cloth beauties! Either way it looks great! Hard to beat 9.99 when you need such large curtains. Recently I've been shopping for curtains with an 84" length, I can't imagine how expensive they would be any larger! I love your new curtains, but am really thinking of those drop cloth curtains. Been looking for something temporary for my mother and I think those may do it. I've been planning to make these for three years...obviously, I'm still in the planning stages... I've just got to get some fabric! 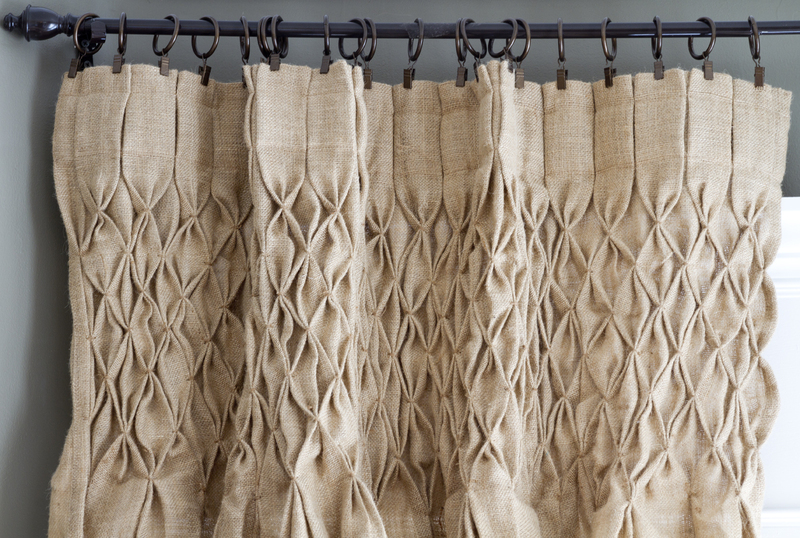 I saw some Silk Dupioni Smocked curtains in a swanky store and I've never been able to get them out of my mind! Yours are GORGEOUS whether you made them or not!!! They are gorgeous, Karianne! I wish I had a window that I could get them for! Thank you for the details on the smocked curtains! What a wonderful gift your mom got for you. I am seriously, seriously of thinking about purchasing a pair for my dining room. Do you think they would go with walls that are painted in a yellow gold color? I know it's hard to make an opinion when you can't see my paint color in person (here's a post on my blog that shows the color: http://sweetpeasamplings.blogspot.com/2011/12/christmas-time.html ). I'm getting ready to redo the entire downstairs and I just love your curtains! Your mother is most certainly a rock star. :) I do love me some drop cloths, though. I made one into a bed skirt and I love it. I have enough leftover to make some sort of window treatments for the two small windows in the room. Woop! Wonderful curtains! Wonderful home! Wonderful mom! Have a safe and great trip to Haven. Thanks for sharing that link too. Blessings & Aloha! Serious curtain envy going on here - love the detailing! I'll take the seat by the window of that awesome dining room. Please serve chicken, I'll bring dessert. Those curtains are gorgeous.What a fab gift.Out of my price range.I am way too frugal to spend that on curtains.But they look perfect in your dining room. Yes your mom is a rock star!!! She picked the perfect pair to add more elegance to your beautiful dining room! I like the smocked curtains, indeed I do. But I also like the simple look of the dropcloth drapes. I have style ADD. I tell my husband that I think we need (ahem) several homes so that I can decorate each one in a different style because there are so many great ways to put a home together. I, too, read that you were going to Heaven. I am, too, but didn't know that you could plan a trip there. Then I re-focused my eyes and read "haven." I'm glad, because although Heaven is going to be wonderful, we'd miss you here. Those curtains are fabulous! they look beautiful at your windows. I just noticed your Linky followers button. Now Linky following ! So I'm only like 4 months behind, so that's ok right? Of course, I only "met' you like a few weeks ago, but still. Those curtains are awesome! So pretty. Oh and I'm going to haven! I can't wait to meet you for real! Wow that was unusual. I just wrote an really long comment but after I clicked submit my comment didn't show up. Grrrr... well I'm not writing all that over again. Regardless, just wanted to say excellent blog! Noticed a huge difference in the crown molding over the windows between the first and second pictures. The draperies are lovely, but I also loved the look of the drop cloth draperies. I tried them, but they didn't look that pretty. I am wondering what the difference was. Did you wash them first to soften them, by any chance?